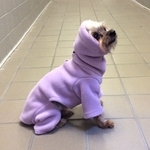 These bodysuits give Toy Dogys full coverage, and keeps them extra warm in winter! They are a perfect fit for Yorkies, Toy Poodles, Chihuahuas and all dog of the Toy size. Heavy Fleece Hooded Bodysuits are highly wind and and water resistant, making being outside in winter fun! The Extra Heavy Fleece is even thicker, for even colder weather. The Windblock Hooded Fleece Bodysuits are made to bear the harshest weather. They are windproof and waterproof, making the cold impenetrable.The Extra Heavy Windblock is so thick it almost feels like a coat! Windblock Fabric is made with 3 layers, a fleece on the outside, another on the inside, and a plastic shield in between. It is the warmest suit we have. To put a hooded bodysuit on easily, just roll back the hood to pull over the head, then put the rest of the suit on. As with all our clothes, there is no velcro or zipper. Bodysuits can be washed in cool water, then air dried. They should never be worn inside. Our Hooded Bodysuits provide outstanding warmth and comfort, as well as great looks!